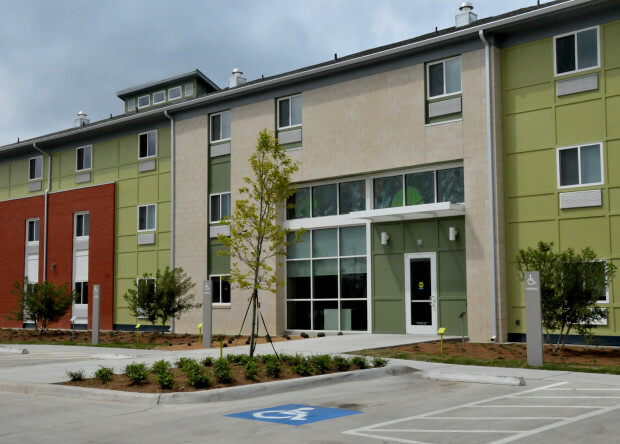 New Hope Housing, a Houston non-profit; built Rittenhouse in 2013.This 160 unit, low income housing SRO, provides its residents with a sense of dignity and beauty. The building was designed by Glassman Shoemake Maldonado Architects. 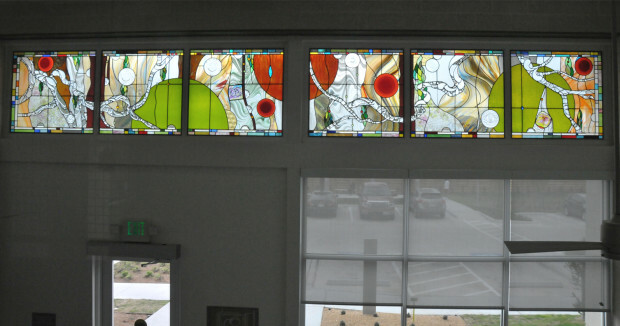 Four stained glass windows span the entrance, and are (approximately 47"H by 42" W (55 square feet). 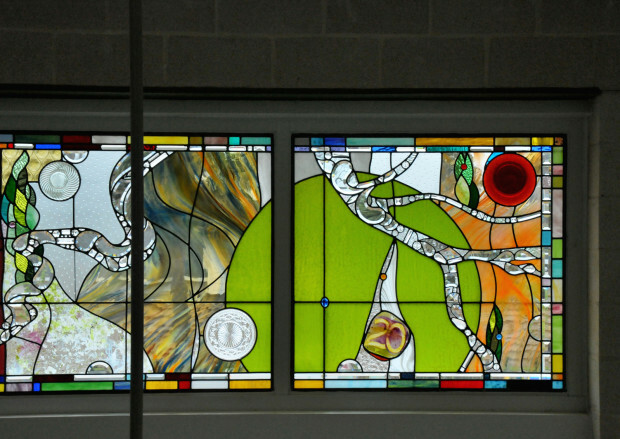 The windows incorporate depression glass plates, jewels, prisms, painted glass, and bevels. Rittenhouse is a building with architecture so exciting in the way function and form intersect creating a space so pleasing for its residents. The palette seen throughout the complex plays an important role. 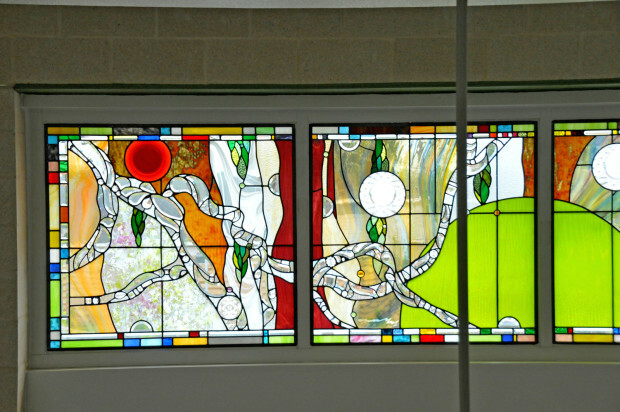 The stained glass is in a prominent place in the entrance. In the evening the windows serve to 'light up' the parking lot, and by day they were designed to bath the walls in color and movement; depending on the time of year. I had worked with New Hope Housing once before in 2010. I have also worked on numerous projects throughout the years with the architects at Glassman Shoemake Maldonado Architects... we all seem fluent in one another's dialects, and it was a seamless collaboration. Being given total freedom to create imagery "my own way" does not preclude an overall obligation for the windows to be another piece of a vision that took place well before I came to the table. There was one request, and that was that somewhere in the windows there be the number 20, in celebration of the anniversary of New Hope Housing. After being hired to do the commission, a meeting was scheduled with Ernesto Maldonado. I left his office with elevations and a file of paint chips, finishes etc. 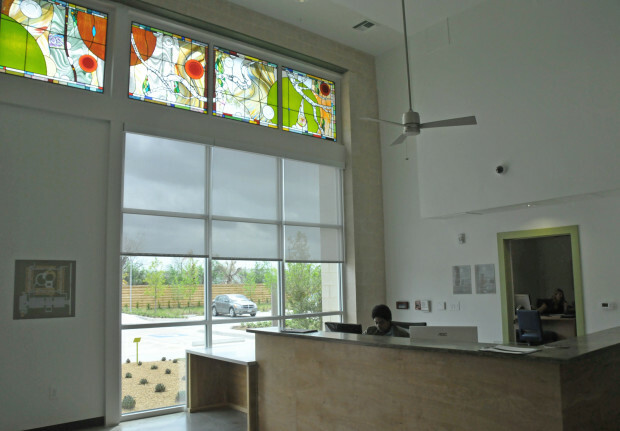 The site had a large grove of BEAUTIFUL live oak trees that were to be showcased in the central courtyard of the development and on the side of the parking lot. Live oak trees are known for their remarkable branches. Suddenly I saw 'branches' running across the image. Each would be comprised of crystals, prisms, and bevels. These organic shapes would sometimes shadow the branches on the walls in the form of rainbows, rainbows and more rainbows. I presented a loose drawing explaining that once I began, the glass would also decide where things would go. The drawing was just the skeleton of what would be the final product. I also provided glass samples to show what the colors on the drawing really meant. They trusted me, and the concept was approved. We installed the windows a week before the grand opening.